Are you here because you opened your insurance renewal documents, saw the rate increase and wondered, ‘What is going on! ?’ If so, you’re not alone. Insurance rates are going up for most people – regardless of how long they’ve been insured or how many claims they’ve made. 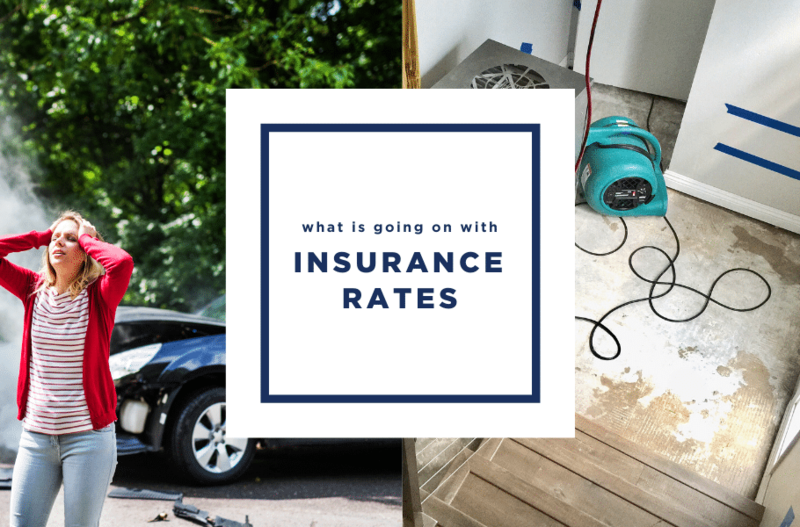 What is going on with rising insurance rates? When insurers experience significant losses, they must make major changes to ensure their company stays profitable. Right now, Canada is experiencing a period when insurance company premiums are increasing and their ability to write new business is decreasing. A series of catastrophic events, a lawsuit-first approach and/or a poor economy can reduce insurers’ capacity to write new policies. This is known as a ‘hard market’. When the market hardens, insurers tighten their underwriting standards. Because of new technology in our vehicles it now costs more to repair even a fender bender and rehabilitating those who sustain injuries have escalated astronomically. But I’ve never made a claim, so how does this impact me? For the next while you can expect rates to increase on renewal. There is no magic crystal ball to look into, but we expect this to last for 18-24 months until rates stabilize. Ensure you are doing everything to keep in good standing with your insurer. Never miss a payment or be canceled for non-payment because this could have serious repercussions – today and long down the road. Most importantly, you need to speak with us and have an honest conversation about your current needs. Update your information – tell us if you’ve updated your home’s plumbing, wiring or roofing. It could help lower your premium. Review your coverage – schedule an appointment with your Account Manager. They can tailor coverage to meet your needs. Adjust your deductible(s) – in some cases, increasing your deductible may help lower your premiums. Contact us to see if making a change will help you. Bundle your coverage – consider us for all your insurance needs to maximize discounts. Talk to us about your specific risks – we can tell you the biggest risks facing your property and suggest additional actions to protect your home and reduce your premium.